What is that under your pants? Men's underwear is important for holding a mans you know what in place and covering his rear end. Under garments come in various colors, shapes, and sizes. Pardon the pun, but below is a "brief" introduction to the clothing guys wear under their pants. Briefs This classic cut fits close to the body and offers comfort and just the right amount of coverage. Briefs were first sold on January 19, 1935 by Coopers, Inc., in Chicago, Illinois at Marshall Field's department store. They dubbed the new undergarment the "Jockey" because it offered a similar degree of support as the jockstrap (one style of which is also called jock brief or support briefs). The designer of the new style was reportedly inspired by a postcard he had received from a friend visiting the French Riviera depicting a man in a very short, form-fitting bathing suit. In North America, "Jockey shorts" or "Jockeys" became an often used generic term for men's briefs. More recently, "tighty-whiteys" has become a commonly used nickname for briefs. In the case of men's underwear, briefs, unlike boxer shorts, hold the wearer's (you know what) in a relatively fixed position, which make briefs a popular underwear choice for men who are participating in athletic activities or who feel they need more support than loose-fitting underwear can provide. Athletes may prefer briefs over because boxers often ride up the body when the wearer is running. Boxer shorts (also known as simply boxers) are a type of undergarment typically worn by men. The term has been used in English since 1944 for all-around-elastic shorts, so named after the shorts worn by boxers, for whom unhindered leg movement ("footwork") is very important. Most boxer shorts have a fly in front. Boxer shorts manufacturers have a couple of methods of closing the fly: metal snaps or a button or two. 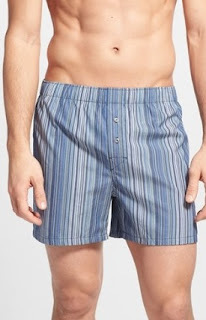 However, many boxer shorts on the market do not need a fastening mechanism to close up the fly as the fabric is cut and the shorts are designed to sufficiently overlap and fully cover the opening. This is commonly known as an open fly design. Boxer shorts are available in white and solid colors including pastels, and come in a variety of patterns and prints as well; Traditional patterns include "geometrics" (small repeating geometric designs), plaids and vertical stripes. Additionally, there are innumerable "novelty" boxer short patterns. Boxer shorts are produced using various fabrics including all cotton, cotton/polyester blends, jersey knits and silk. Boxer Briefs boxer briefs offer length with fit that’s a little roomier than trunks, but not as roomy as boxer shorts. Boxer briefs are sort of a hybrid between briefs and boxers. They offer more coverage than briefs and offer more support than boxers. Boxer briefs (or tight boxers) are a hybrid type of men's undergarment which are long in the leg, like boxer shorts but tighter-fitting, like briefs. Depending on the manufacturer, boxer briefs may also be spelled as one word: boxerbriefs. They are sometimes called "trunks" in the United Kingdom and Australia. It is rumored that boxer briefs were pioneered by designer John Varvatos during his 1990–1995 stint at Calvin Klein as head of menswear design. However, we are not certain that he created the first pair. While some may find regular briefs too restrictive, others may find boxer shorts too loose. A pouch or "over sized" pouch may be built in to add space and position the the your know what with more room. Boxer briefs are commonly used in athletics instead of, or in addition to a jockstrap, but are common for everyday usage as well. The boxer brief design provides form-fitting coverage for the midsection from the waist to the thighs and are worn on the waist. They are usually made of a combination of cotton and spandex or a soft, woven flannel material. Boxer brief designs can have either a keyhole fly, button (snap) front, pouch, or no fly at all. The waistband is usually a separate band of elastic material, often in a contrasting color to the cotton or flannel material that comprises the rest of the boxer briefs. Yes, men also wear bikini underwear, g-strings, and thongs. If you are interested in shopping for men's underwear you can find men's underwear stores in the fashion retailer section here on Apparel Search. When purchasing underwear, keep in mind the fabrication. Woven fabric does not offer as much stretch as knit fabrics. You may want to also check the men's underwear store that we created using product from Amazon. You can shop for men's underwear at stores such as Nordstrom, Neiman Marcus, and even Walmart. Men's underwear brands include Jockey, Hanes, Fruit of the Loom, Calvin Klein, 2xist, BVD, and the list goes on and on. If you have more details you wish to share, please use the comments section on this underwear blog post.